Stake in the ground: Captain America: Civil War is the best Spider-Man movie we’ve had so far. It is also a solid Avengers movie, an unflinching follow-up to Age of Ultron. It is a pretty good Captain America film, but there are so many important players in the story it doesn’t really feel like Cap’s movie. That poster is crowded, and it’s still missing two of the costumed combatants¹. The real question is not whether the film lives up to its title. It’s whether it lives up to our expectations for Yet Another Awesome Marvel Movie. Here I will unequivocally affirm that maybe it does, but it was kind of long, and for the love of Uncle Ben can we PLEASE hold the camera steady? Yeah. Shaky-cam. A lot of it. During fight scenes, of course, but also on a couple of no-stunt, not much movement shots where we’re supposed to feel tense and off balance. Dear Hollywood: STOP THAT. Those moments were plenty tense without the wobbly tilt-and-jiggle that managed to induce actual motion sickness. Here’s a comic-book trick, Hollywood: keep the camera steady, but shoot those tense, off-kilter moments at a slight angle. During fight scenes, keep each shot steady, but give us steep angles. These people are flipping and jumping off of walls. Camera angle will sell their dynamic, athletic heroism far better than shaky-cam will, and will also let you showcase the amazing work that the stunt team has put together². Oh, hey, you already know that trick, because you used it perfectly on Spidey’s action. What’s the excuse for not using it elsewhere? But back to Captain America, and the question as to whether or not this was his film. One of Cap’s best speeches from the comic books (the one that has the word “move” in it, and which I won’t spoil³) is not delivered by Cap in this movie. It is delivered by somebody for whom it is perfectly in character, but it is delivered to Cap, not by him. 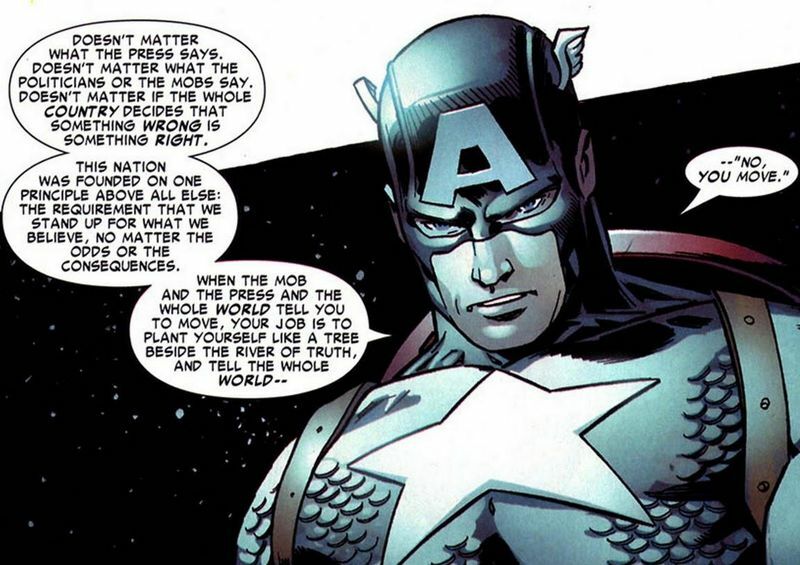 So, for an audience a thousand times the size of the audience familiar with the original quote (at least) this epic, quintessential Captain America speech doesn’t belong to Cap anymore. So… I don’t think this is really his movie. He’s in it, and central to it, but it belongs to the players around him. Who are awesome, just so we’re clear⁴. 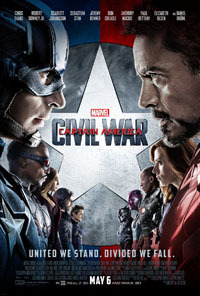 Captain America: Civil War squeaks past my Threshold of Awesome on the strength of a great story and a strong ensemble, but only enters the list at spot #5 thanks to the weak and trembling hands of whoever was holding those cameras. ¹ Spidey and Ant-Man, who were an exceedingly entertaining addition to the line-up. And yay! This awesome new Spidey is part of the Marvel Cinematic Universe, and is getting his own movie! ² I think closing credits for films like this should list the stunt performers right next to the actors for whom they doubled. Their physical performances were a huge part of creating the character on the screen. I bet they’re not being paid enough, either. ³ Okay, fine. It’s behind this link. And don’t get me wrong, the line is delivered brilliantly in the film, and it feels more powerful for not having come from Cap. ⁴ When we can actually see them, because as long as I’m still holding this hammer I might as well pound that nail out the back of the board, and then pick it up again and pound on it some more. Maybe with enough nails the camera will hold still. It earned its high and low points. Marvel has successfully extended their line of credit with me through their next two cinematic releases, no matter what those releases are*. 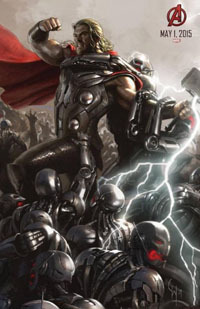 If you’re planning to see The Avengers: Age of Ultron you are in for a treat. Also, be warned that there are spoilers you definitely don’t want, so don’t delay, and until you see the film you should steer clear of reviews, comments threads, and inconsiderate people.